I had the enormous pleasure of meeting Reece. Reece is a thirteen year old boy that took part in the South London Dyslexia Charity, Dyslexia For The Wise's Short Story Competition. 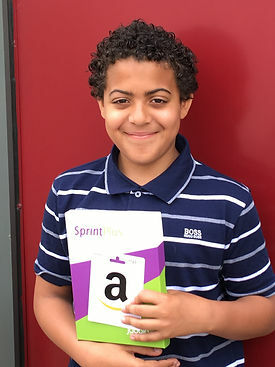 Reece was the winner and I was meeting him to find out more about him and his story and to present him with his prize from competition sponsor, Jabbla, which was a copy of the literacy skills software, SprintPlus. Reece's story was called 'The Unknown' and it is fair to say that I did not know how much I would enjoy reading that story! Reece, is thirteen years old and was diagnosed with dyslexia at the age of eight. At the time, his school would not test him for dyslexia because he was able to get by with his dyslexia and produce good grades for his SATS tests. When talking with Reece, it was evident just how intelligent he is. When I asked him about how he experiences having dyslexia he told me that he sometimes misses out words when writing, he struggles with focusing and attention and sometimes he has fantastic ideas, but often forgets them because he hadn't quite found a way to 'capture' them so that he could use them later. For me this is a really interesting question regarding dyslexic children. Is it right for schools to ignore the needs of a child with any SEN even if they are doing well at school? Is this not a situation where a dyslexic child, whilst delivering good levels of achievement, may actually be missing out on realising their potential because they can feel like they are being held back from being the best that they can be? Certainly in the case of my daughter, whilst passing everything, without support she would not have gained such good grades in her GCSE's. Her self esteem was low at the time and being empowered to realise her potential, this not only helped her with her mental health but enabled her to choose opportunity for the future that fits with her aspirations. When Zoe from the charity, Dyslexia For The Wise got in touch and asked SprintPlus to support their writing competition, it was of course an honour to facilitate this, however, I was concerned about reading lots of stories and what standard those stories were going to be. Unfairly, I guess I had quite a low expectation of reading stories that wouldn't quite resonate with me or interest me personally. So when I received Reece's story about a wolf hunting down a little girl in the woods, I was surprised. Firstly, by Reece's ability to describe a forest which was damp with 'death hanging in the air' and to then put a killer in those woods, a wolf seeking their prey which was a little girl. Surely a 13 year old boy could not have written this? What's more, he included in the team an armed group of guards that were hell bent on finding that wolf. How he packed in so many aspects into this gripping story was impressive. To top it off, Reece put a twist in the end of the story that I totally didn't see coming and really surprised me. When talking to Reece, I asked him if I could share the story on my blog, but sadly he didn't want me to. I am sure that if enough people contacted me I may be able to get his permission but at the moment I am not sure if he was confident that people would enjoy his story. Maybe that's a little bit of dyslexic self esteem kicking in there? One of the things that really annoys me is the myth that people with dyslexia can't write. Whilst they may or may not have the physical ability to get words or ideas down on paper (sometimes this can be the case)it does not mean that they are not great story tellers. So if we give them the tools with which to capture their ideas and that allows them to express those thoughts, ideas and stories then we give them a way to break free from imposed ways of expression commonly found in school and allow their dyslexic strengths to kick in and impress. When I presented SprintPlus to Reece, he seemed please that he had a way to check through his work using text to speech software in a straightforward way. I also showed him how to use Mind Mapping as a technique which is an excellent way to get ideas out in a non pressured and positive way. I showed him a piece of software called Mind Genius which would be useful to Reece because he told me that he often writes the endings of stories first but finds that somewhere in the process he forgets them. Mindmapping would help him enormously. Together mindmapping and text to speech presents a powerful writing tool for anyone story teller who finds challenges with getting expressing their story with literacy. Reece is a great example of someone who is dyslexic who uses those famous dyslexic creative strengths to tell stories and win prizes. It was an absolute pleasure to meet him and I hope that he writes more stories (that said he also told me that he prefers maths so maybe we won't see another story for a little while yet... ).